Cultural Owl Figurine in Sterling Silver and Gourd, "Shipibo-Conibo"
Inspired by the indigenous Shipibo-Conibo people of the Peruvian Amazon, Maria Astuhuaman creates this charming figurine. 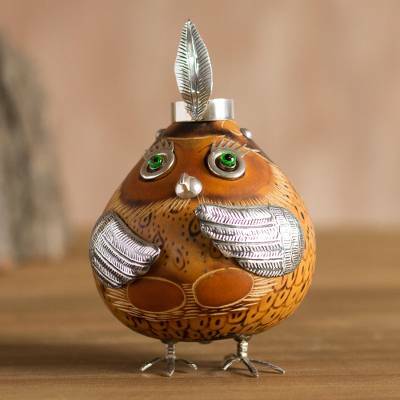 Crafted from a gourd, a delightful owl makes a charming addition to your home decor. The bird's headdress and other accents are made from embossed sterling silver. The size, shape and color of each natural gourd makes them unique. No two are ever identical so slight variations are to be expected. "My family motivates me to continue. I want to see my children happy. It's exciting to share the artistic wealth of my country and our ancestral legacy." "I'm Maria Flor Astuhuaman Caro. I was born in 1957 in the beautiful province of Junin with its vast variety of climates and riches. The weather is moderate but, in the high sierra, it's quite cold. And the jungle zone is tropical. "I consider myself a persistent and, above all, a responsible woman and I'm committed to what I do. My life has had some complicated moments. Raising my children hasn't been easy. I want to help them get ahead and give them the best I can so that in the future, they'll be able to meet their goals. What I want most is for them to be happy. "I have high hopes for my workshop. With the help of my family, I want to be able to reach more shoppers and strengthen our Andean art forms. And my secret dream is to be recognized one day along with other mate gourd artisans who embellish our work with the beauty of Andean silver. "At first, I never imagined that life would lead me on a path of art. In the 1980s, I studied nursing and worked in a district clinic. I practiced this rewarding career for many years. Then we faced some tough times and some of us on the staff were laid off. I found myself without a job. "But I couldn't let this get me down because I had the responsibility of my children. I had to find a way to work. I signed up in a school for artisans and there I met the man who became my children's father. He comes from a family of great silver artisans. "To learn the ancient Andean art of mate gourd sculptures required a great deal of will power and continuity. I took training courses and attended workshops. I love working with dried gourds. With my family, I promote reusing materials that we embellish with silver, as we work with gourds that wouldn't be used for anything else. We give them a new life through art. "I believe what I like best about this work is seeing the happiness of shoppers when they perceive the meaning and history of their purchases. "My family motivates me to continue. I want to see my children happy. It's exciting to share the artistic wealth of my country and our ancestral legacy. I try to convey all this in my art. In addition, I've been able to tech a number of children from low-income families in different parts of Peru. "I'm proud of my beautiful family and what we're building together through our effort and the hard work of my husband, Alejandro Rodriguez Pomalaza. He is a master artisan who has received awards for his years of art. I learn so much from him every single day. Today, my children help with organizing the workshop. They take care of the accounting as well as the promotion because, together, we're a great team."